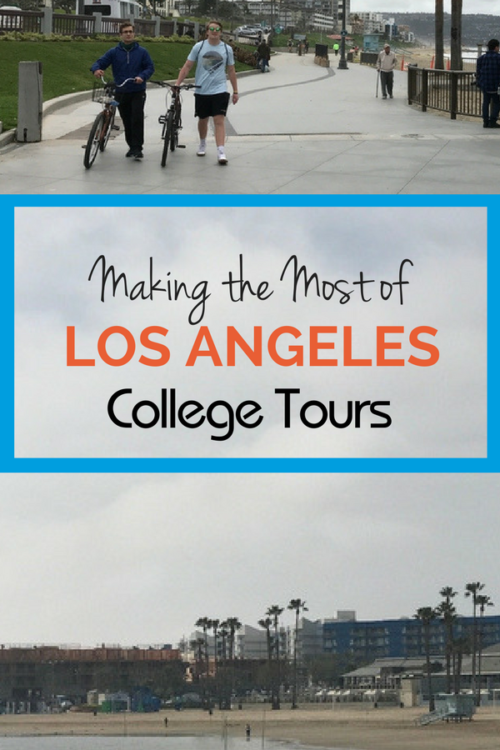 College touring in California? Then plan on getting a taste of all the delights California has to offer. Who knows? Your student may decide to attend a college or university there and you’ll be making a main course of California. Or, quite the opposite, the campus experiences may leave you hungry to see more schools. But at the least, make the most of your combined college tours and vacationing without biting off more than you can chew. Here’s how we tackled the last leg of our California college tour in Southern California. 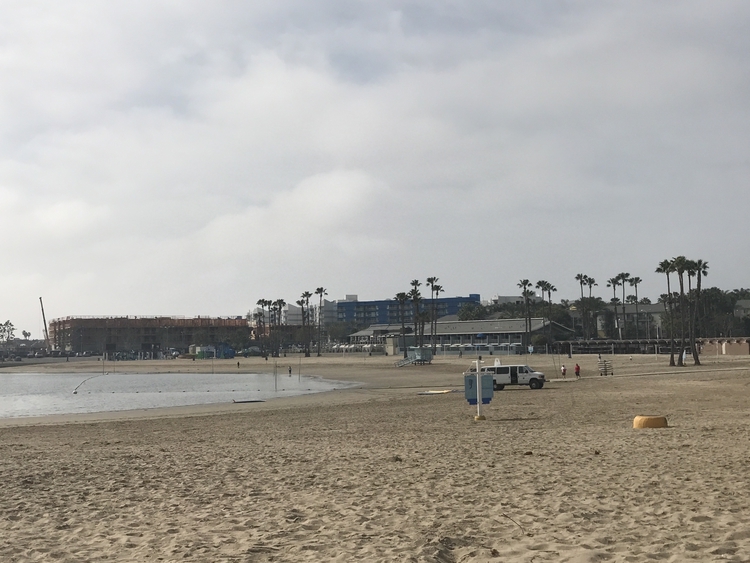 From Marina Del Rey to Redondo Beach, USC and UCLA, we covered some ground in our 2 day college tour blitz in Southern California. College tours and info sessions are not nearly as appealing as surfing, hiking, biking and eating in Southern California. So a plan is important. Southern California college tours have to be planned not only around personal and campus tour schedules but around wicked unexpected traffic. We expected some traffic on our San Francisco college tours, but in SoCal, we planned around traffic. If San Francisco traffic is a challenge, then Los Angeles traffic is a game. For instance, our hotel was only 18 miles from USC but we our GPS said it would take 92 minutes. We left 2 hours early. You can’t be afraid of being too early. It Never Rains in California. Not. My husband is a USC Trojan so it almost goes without saying that we would take a tour of that campus and attend the info session. For 2 hours in the slanted blowing rain, we sloshed around campus looking for cover so we could hear our guide evangelize about the rewards of being a student at USC. Across town, our tour of the rival UCLA, had the unfair advantage of better weather and an entire village dedicated to students. Moral to the story: bring rain gear, even to sunny Cali. Another key college touring tip: try to visit campus while school is in session so you get a real feel for the energy of the school and always make an appointment. This is especially vital when traveling cross country to visit schools. And by all means, factor in enough time to be on time. And, while we’re talking about the potential for my son to travel thousands of miles away from home for college, of course I have to think about what would happen if my son were to get sick. I checked into Medjet, an emergency evacuation membership and their key difference is that they will send you to your hospital of CHOICE and others send you to the nearest hospital. Great for college kids who are miles and miles from home. Marina Del Rey is a growing tourist area because it is centrally located in LA, near the airport and near the beaches. It’s equal distance from USC or UCLA and there is plenty to do (and eat!) in the area. 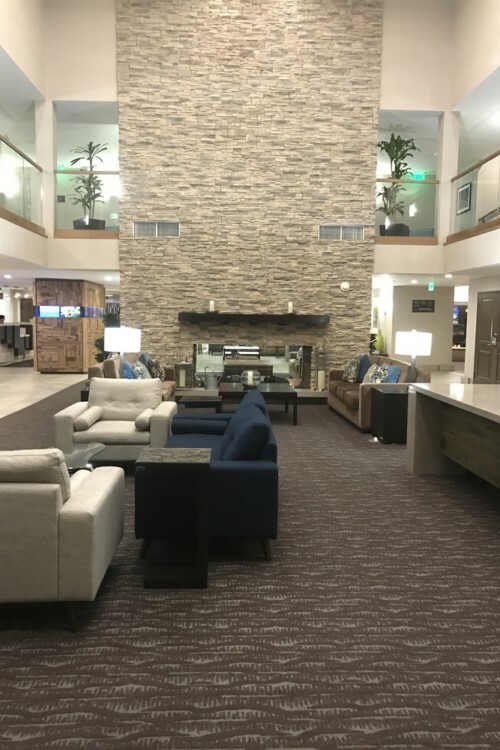 Great lobby at the Hilton Garden Inn in Marina Del Rey. Photo credit: Kim Orlando/Traveling Mom. I would have preferred having a suite or one of their king suites with a wall partition but they were occupied. Our single room with two queen beds felt a little crowded since I was traveling with my son and his friend but it was only for two nights. Book your hotel ahead of time so you can get the room you want. 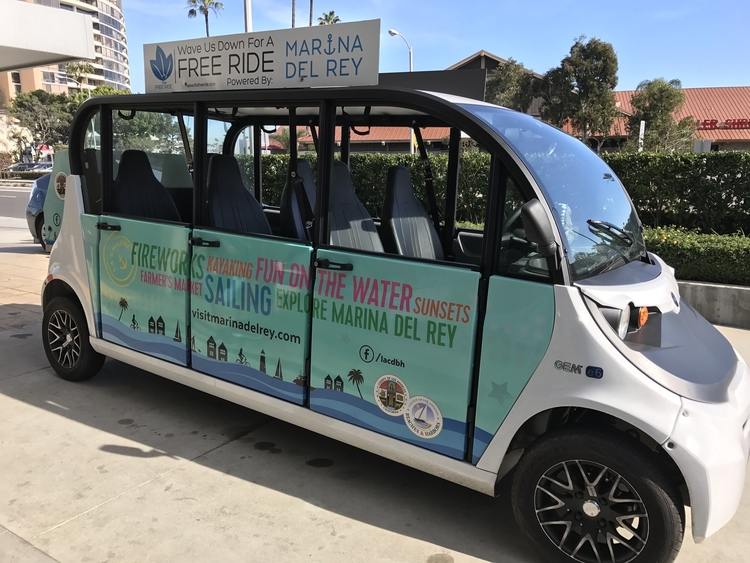 Marina Del Rey shuttle saves you from driving! Photo credit: Kim Orlando/Traveling Mom. Marina Del Rey has its own shuttle to cart people around within a 1 mile radius. Text the address where you want to be picked up and voila they appear. One mile is enough distance to take you from the hotel to the library, great food, paddleboarding, kayaking and shopping. The boys did some stand-up paddleboarding in the bay, which was a great learning experience because the water was so calm. Mother’s Beach is well known for its wave-free water, making it super baby and toddler friendly. The parks offer free wi-fi and free festivals in the summer. Mother’s Beach (Marina Beach) earned its name because of the roped off swimming area and lack of waves makes it perfect for little ones to wade and swim. Photo credit: Kim Orlando/Traveling Mom. Bikes are available for rent at the hotel and a short bike ride away is Marina Village, a kitschy landmark village of shops and seafood. It hasn’t changed much since I biked near it 20 years ago but there are big plans to renovate the entire area. It’s still a lovely walk and favorite tourist stop. There is a water taxi that will take you to 8 different stops on the bay for $1. Having lived in LA in the 90s, I remember Killer Shrimp from back in the day, It used to be a whole in the wall in a strip mall, serving shrimp in a delicious bouillabaisse 3 ways: with rice, bread or pasta. We always ordered a bucket of Coronas and sopped up the sauce with loads of bread. Now it’s a whole new huge brand with an expanded menu, a 24 hour cafe next door and a gorgeous view of the water. The staple menu item is still their signature Killer Shrimp in bouillabaisse but I will go back for the outstanding crab claws that they just added to the menu. Oh–and the bread pudding. Unique fact: Killer Shrimp has one employee whose job is to dole out the spices into baggies to have ready for the chefs. Now that’s some dedication to the right balance of spices! If you are visiting Marina Del Rey in your boat, you can dock and dine at Killer Shrimp. It’s like free boat parking while you eat in the restaurant. 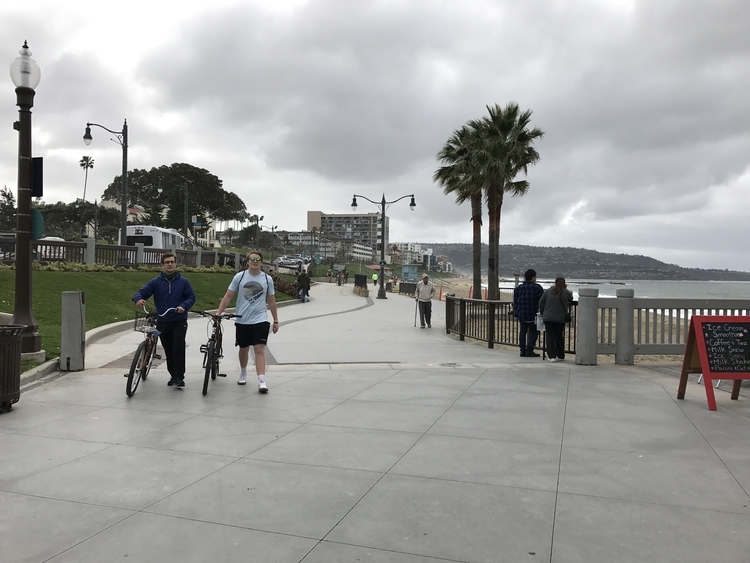 Beach Boys, surfers, bike paths and palm trees – that is Redondo Beach. After days of college tours, too much driving and unpacking, our reward was 2 days at the beach. 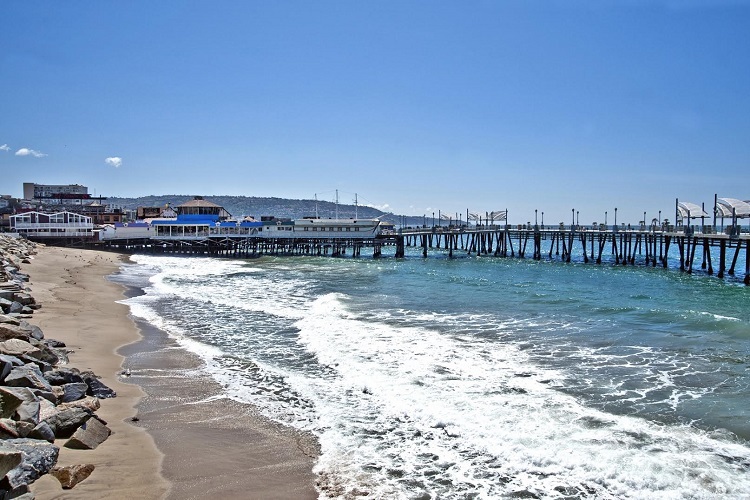 Every beach has its own personality and Redondo is known for being family friendly, casual and relaxed. Riviera Village has sweet shops and coffee stops. North Redondo, where we stayed is close to the freeway but about 5 miles from Manhattan Beach and 10 miles from the sands of Redondo Beach so plan accordingly. Redondo Beach is best toured by bike. You can get to many off the beaten path spots like the Farmers Market. Photo credit: Kim Orlando/Traveling Mom. 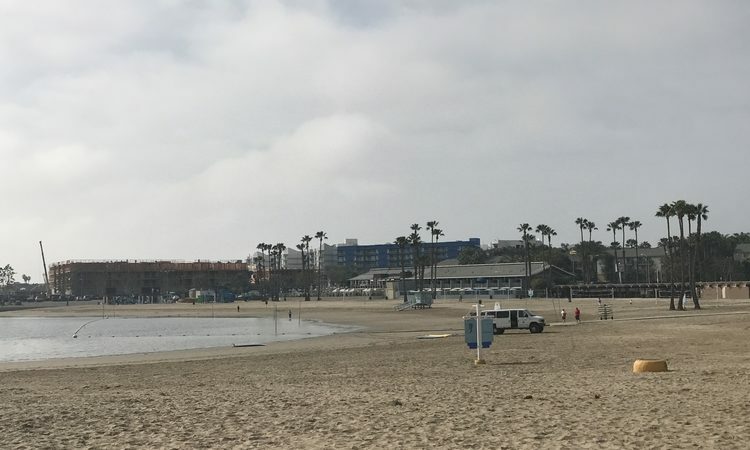 Because of the way the city of Redondo Beach is shaped, our Hilton Garden Inn was not on the beach; we were technically closer to Manhattan Beach than Redondo. The hotel offered a shuttle to Redondo Beach and within a 3 mile radius but only on weekdays. However, the Redondo Beach train station is a three minute walk from the hotel. We did not have time to explore the train but I would stay there again just for that access. HGI is bright and clean and bustling with groups and business travelers. The breakfast buffet ($14.95) looked fresh and plentiful and the HGI sports bar’s happy hour featured $ 3 drinks and $5 appetizers. We did not get to sit outside or enjoy the pool because of rain and uncharacteristic cold weather. Speaking of rain, adjoining rooms make rainy days easier to enjoy. You can relax in your room without being on top of each other. The price for the rooms made that decision easy too – $129-$149/night. Unique feature: For $20 (free for suite guests), the Hilton Garden Inn Redondo Beach has a special brand of scented Greek toiletries for those that are serious about their scents. I still don’t get the connection but the front desk gave me several samples, with enthusiastic endorsements. I tried it all and I am not a fan. The shower gel, shampoo and body lotion were too perfumey for me. Laundry Service: I tried a new service in Redondo, albeit a little too late into the trip: a 24 hour laundry service to pick up and deliver our laundry for $ 1.65 per pound. But be forewarned, there’s a 10# minimum. I recommend the idea but this service still has a ways to go in the folding department. Having laundry done can help with lightening your packing load. Hey, I’m all for saving money on baggage fees. Our fun activity was to get bikes with Marina Bike Rentals. The owner is a retired police officer who has been renting bikes to tourists for 28 years. Major and I mean MAJOR perk: Marina Bike offers free parking. No time wasted looking for parking and quarters to pay for parking. The bikes are well tuned and there are several types to choose from: cruisers, road bikes, cruisers with speeds, etc. We logged miles from Torrance, Redondo Beach village, the Redondo Pier, and the Fisherman’s Wharf Village. Biking is a fantastic way to see a city up close and it’s likely you will find unplanned treasures. We happened on the local Farmer’s Market and where we tasted guava and Cara Cara oranges. Kincaid’s reminds me how nice it is to have a fancy dinner and get dressed up a bit more. The restaurant is partnering with Le Chef Bakery, Newport Meats and Kenter Canyon Farms for seasonal produce from local and regional growers. Hands down, the calamari was the best I’ve had anywhere, light, tender and crispy, like my mother-in-law makes it. The teens chose Lamb Chop and Seafood Risotto, and if the clean plates were any indication, they loved it! That the beauty of dining out while traveling with teen boys: no to go boxes! Can’t decide between the steak and seafood? Go with the dinner combos like Grilled Smoked Sirloin & Jumbo Prawns or Filet Mignon & Petite Lobster Tail. 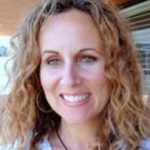 Redondo Year-round: Visit Redondo has all the event and festival information. If you’re fortunate enough to visit in December, don’t miss the Holiday Boat Parade, a local tradition for over 50 years.